Alphabet's Waymo is focusing on self-driving semi trucks -- as well as ride-hailing vehicles -- for its autonomous driving technology. The autonomous-driving race continues to accelerate, with a notable advance coming from Alphabet's (GOOGL - Get Report) (GOOG - Get Report) Waymo earlier this month. As we chugged through 2018 and got closer and closer to year-end, many industry observers were wondering if Waymo would be able to commercially launch its self-driving taxi service this year. Lo and behold, the company pulled it off, launching Waymo One just a few days ago. It's an important step, even if there are clear limitations. 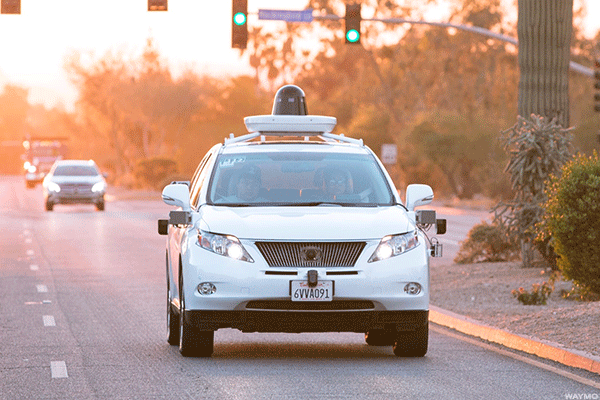 The company has been testing its Waymo service to a select group of participants for almost two years in the greater Phoenix area. For now, it's still operating on a soft-launch basis, servicing 100 square miles and still only accepting Early Rider program members. Many of the vehicles still have a safety driver as well. Still, we should not be disappointed by what we have today. Waymo has officially launched a program that can dramatically shift the transportation landscape moving forward. In other words, ride-hailing a self-driving car is only one part of the equation. Another part? Autonomous semi trucks. A recent video of a Waymo semi truck from Sunnyvale surfaced earlier this week, showing that the company still has plans to branch out from its current business. This isn't the first time drivers have seen a Waymo-branded semi and it won't be the last. But it spells even more opportunity for the company that many consider as the leader of the autonomous driving movement. While many consider General Motors' (GM - Get Report) Cruise to be a close second, Daimler (DDAIF (being powered by Nvidia (NVDA - Get Report) ) and other players are coming to the scene as well. But with Waymo One launching in Arizona, other cities likely aren't far behind either, particularly as the company is ordering more than 60,000 vehicles from Fiat Chrysler (FCAU - Get Report) . Waymo has plans to hop over the pond and operate in Europe as well. Given its big plans for autonomous driving, it makes sense that Waymo wouldn't limit it to just ride-hailing services. That's particularly true when considering the financial opportunity that lies with solving the self-driving semi truck equation. "We're really not a car company," Waymo CEO John Krafcik said in a recent CNET podcast. "We're building really great, really safe drivers that can be deployed in a lot of ways." The company put the same suite of sensors on a Class 8 truck and "it works very well with very little modification required," he said. That shows promise, both for Waymo and the industry. Almost 40% of trucking costs come from the driver, so it's easy to see where the motivation comes from to automate parts of the industry. After listening to a panel of industry executives earlier this year, many believe that autonomous driving is about three years away. Of course, it won't be an overnight switch. Rather than taking away all the jobs and automating the entire process, autonomous trucking solutions will first help eleviate the driver shortage the industry has. Like Waymo's current operations, these routes will be along geofenced areas under ideal climate conditions. Given this opportunity, Waymo clearly plans on capitalizing on multiple fronts. The question now shifts to a timeline, and how long it will take to deploy.